The Atlantic Theater has been home to some of my most satisfying theatrical experiences over the years — the original Off-Broadway production of Spring Awakening, Lucy Thurber’s Scarcity, and, now, Rod McLachlan’s Good Television, which unfortunately plays its final performance tomorrow. This last one snuck up on me. A behind-the-scenes look at the production of Rehabilitation, an Intervention-like reality television show, Good Television follows Connie, a therapist-turned-producer, as she works on an episode featuring methamphetamine addict Clemmie (John Magard) and his family. That she’s doing so in an environment in which the success of the program has resulted in an increased episode order, and that her boss is leaving for a lucrative position at an entertainment show, adds to the pressure and stakes. Though some of director Bob Krakower’s choices are a little dicey (he has actors cross behind a screen to make entrances and exits for reasons that seem more practical than dramatic), the show ends up being a powerful look at the ethics of so-called “documentary television,” as well as an insightful glimpse at the effects of drug abuse on the family dynamic. Office politics, in the form of a young associate producer who may or may not have been hired because of nepotism, also play a part in the proceedings. For a play tackling as many themes as this one does, McLachlan manages to keep things tight and streamlined, mixing both comedy and pathos effectively. Much of the success of that balance can be attributed to a universally excellent ensemble. Magard is devastatingly convinving as the drug addled Clemmie, and Andrew Stewart-Jones finds just the right balance of misguided bravado as his brother Mackson. A lot of the comedy comes courtesy of Talia Balsam as Rehabilitation executive producer Bernice; she perfectly captures the breezy energy of a woman who takes her job seriously, but is on her way out. The standouts, however, are Kelly McAndrew as Connie and Zoe Perry as Clemmie’s sister Brittany. McAndrew finds all the right nuances in a difficult part — she’s funny, moving, confident, insecure, tough and vulnerable. 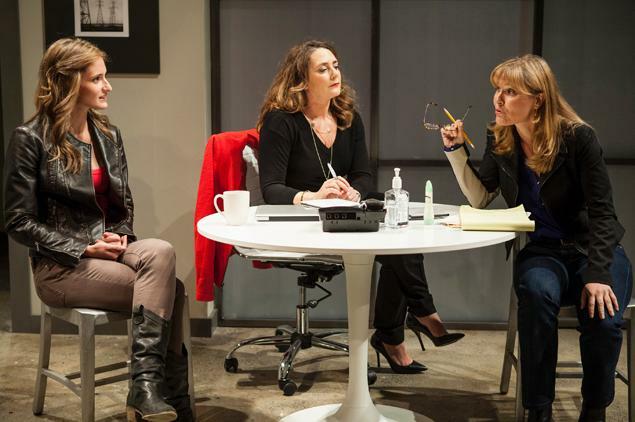 Perry, who looks uncannily like her mother Laurie Metcalf, brings an uncomfortable authenticity to her portrayal of the woman most impacted by her brother’s addiction. Brittany needs help almost as much as Clemmie does, and Perry’s anger and hurt is palpable. Unfortunately this Good Television can’t be DVR’d and watched later. There’s three performances left. Get down to The Atlantic and see it. This entry was posted in Theater and tagged Atlantic Theater, Bob Krakower, Good Television, Talia Balsam, Zoe Perry. Bookmark the permalink.